It was October 1986, and Howard Schultz asked a few of us (there were only a few partners at the time to ask!) to create a special beverage for Christmas for Il Giornale. Having thought of it previously but never having actually tried it, and being a fan of eggnog personally, I brought some in to the office at 2121 First Avenue. We had a small bar set up, so I did a little R & D and served Eggnog Lattes at a meeting. My experiment was a hit! I established right away that straight steamed eggnog was too rich even for my indulgent palate, so I cut it with milk, and away we went! Caught up in the excitement, we forgot to register the name – by the end of that season most of the coffee bars in town were serving it! Howard and I even got a letter from a guy who founded a Seattle café, thanking us for doing the innovation so that all he had to do was watch and copy. So, Columbia Center was the first to serve Eggnog Lattes, and it grew from there. In that first year, I had probably had more of that drink than in all the years since, combined. But I still keep to my tradition – every year during the holidays, I order and enjoy an Eggnog Latte. By the way, if you like Starbucks history lessons, there are a few more of them here. I think it is interesting that the eggnog latte was originally offered in October, but now it is a drink that usually launches in November of each year. (I think anyways!) We’re just a few weeks away from eggnog lattes! What’s the story behind this 1997 Starbucks whole bean poster? Thanks for sharing — the Eggnog Latte is one of my favorites (even though many of my friends turn up their noses at the concept). I heard that Starbucks is only offering Eggnog latte in the PNW in 2014. Does anyone know if this is true? I am not an eggnog fan but the history lesson is wonderful. Re comments about holidays at SB. I can tell you that my local store needs some new signs. Already what they have looks tired and old. Would love to see some holiday decorations, but for once not confined to only Xmas decorations. Why oh why do stores always limit themselves to Xmas? Can’t the desgin be festive and generic? @hayley – great comment about the romance. I agree less is from the gut these days. Great post! It’s nice to learn about the creation of some of our seasonal traditions. The Eggnog Latte is not one of my favorites but I do have one or two during the season. My favorite holiday beverage was the Maple Macchiato. I think the last time my store offered it was the holiday season of 2006. I have tried to recreate it with little success, I just can’t get the taste right. Maybe one day we’ll offer it again. Thanks again Melody for all the hard work you do with the blog and website! I love the Egg Nog Latte. Its definitely my favorite beverage all year. As for the Columbia Tower location, one of my favorite Seattle experiences was being on the top floor getting buzzed by the Blue Angels when they were prepping for the All Star Game in 2001. But that’s not holiday related nor is it really Starbucks related. Ahhhhh Egg Nog. (Time for a very “odd” partner rec – A Dirty Egg Nog Chai Tea Latte (2 shots in a Grande Chai Tea Latte made with Egg Nog – YUM). This is a really neat story! I had no idea that Starbucks was the originator of this. I was actually just telling one of our newer partners about this drink (she made a face when we all got excited). I told her that I don’t even like egg nog without espresso in it. I’m looking forward to this drink and the caramel brulee! This post brings back memories of busy, cold holiday nights when I was on bar and making egg nog lattes (or chegg nogs). And how about making those huge cubes of reg nog and RF nog? I have a ton of replies to catch up on. Im on my ph, sorry so sloppy. @cd. I fixed that huge, but funny, freudian slip typo. Sadly, Im often writing blog posts late at night, and it shows! I love all the comments in this thread! @Camspi -and baristaxena I love this kind of info too! Oh Melody, thank you for that lovely insight on the eggnog latte! I must admit, I’ve never been a fan of eggnog, but last year I discovered that a Double Tall Breve (with a little more than a “splash” of eggnog) Cinnamon Dolce Latte was the best drink in the ENTIRE world! Omnomnom. @BCav – Thanks! I think eggnog is pretty rich so I don’t drink too much of it, but I do like it now and then. I like the idea of a ‘splash’ of it in another drink. It sounds like it would be good with the cinnamon dulce syrup! MERRY CHRISTMAS FOLKS AND EVERYONE ELSE FLOATING AROUND IN CYBER SPACE!! Now is that festive enough for you? Holiday treat minus the fat, calories | Go Fit Girl! I love the eggnog latte…it is such a treat during the holidays. Thanks also for the history of its beginning. I like eggnog lattes but eggnog frappacinos are heaven ! I thought eggnog lattes were a thing of the past. Glad to hear they are not. My favorite holiday beverage 🙂 I am reading-pour your heart into it, I absolutely love it! 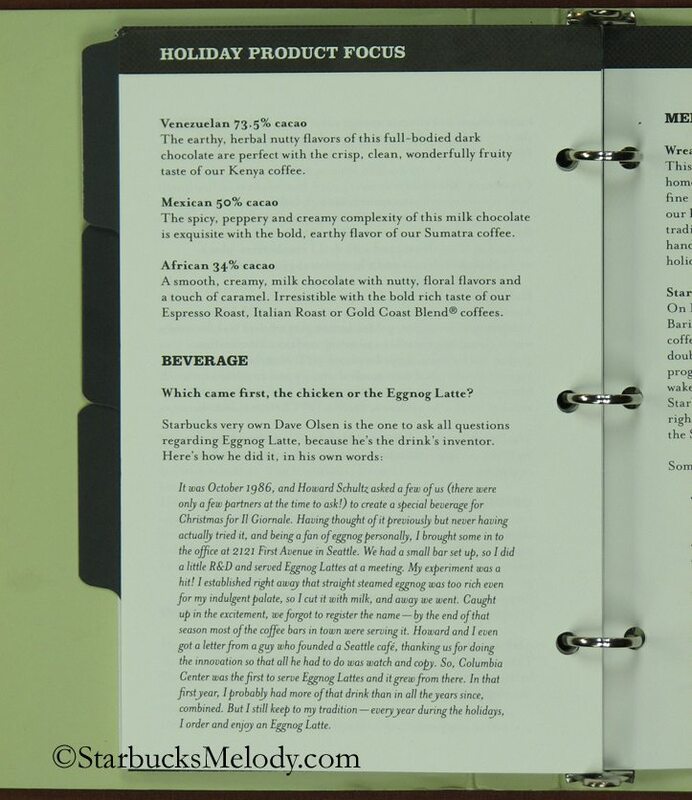 ^ Lots of details on the holiday drinks. Thank you for finding my blog and I hope you’ll subscribe (there’s a side column box for you to enter an email address and subscribe to future updates). Lynn – sadly, it is true – no eggnog lattes unless you are in PNW – it is a horrible thing for them to do to the rest of us.